The complete accident report is available at this link. Avalanches: We would like to sincerely thank the party involved for their prompt and thorough communications with CBAC. 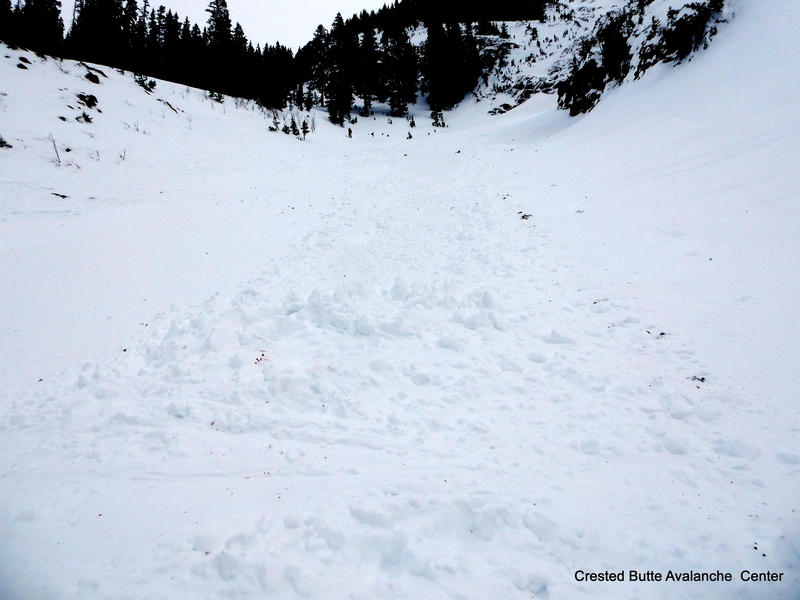 This helps turn an accident into a learning opportunity for everyone, helps us improve the accuracy of our forecasts, and we submit accident data to a national database for avalanche-related research. The slide was unintentionally skier triggered on 2/1/17. We estimate the crown was a 12″-15″ thick hard slab, ~25 feet wide based on photos and descriptions from the reporting party, as well as our on-site observations. The slab likely failed on an old crust or faceted layer. 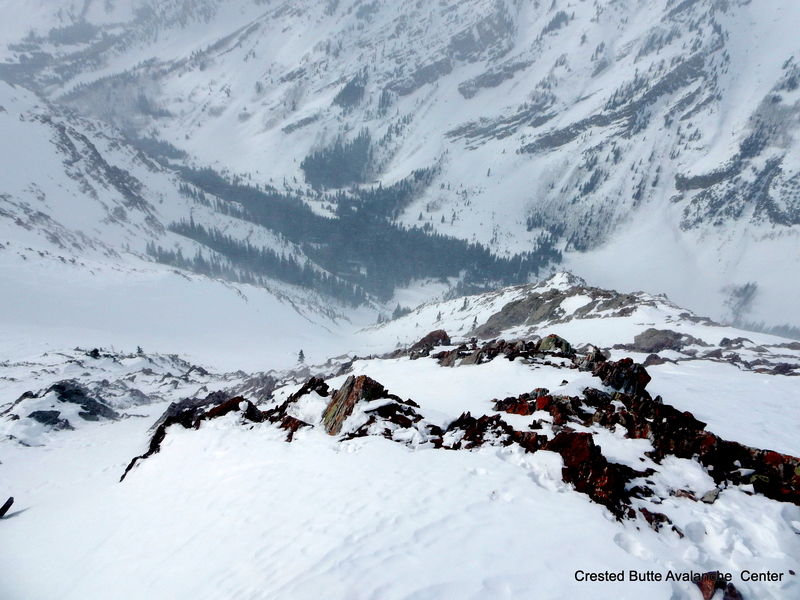 The slab caught and carried the skier approximately 1,350 vertical feet, leaving the skier on top of about 3 feet of debris, a relatively small avalanche. I classified the avalanche as: HS-ASu-R2-D1.5-O. 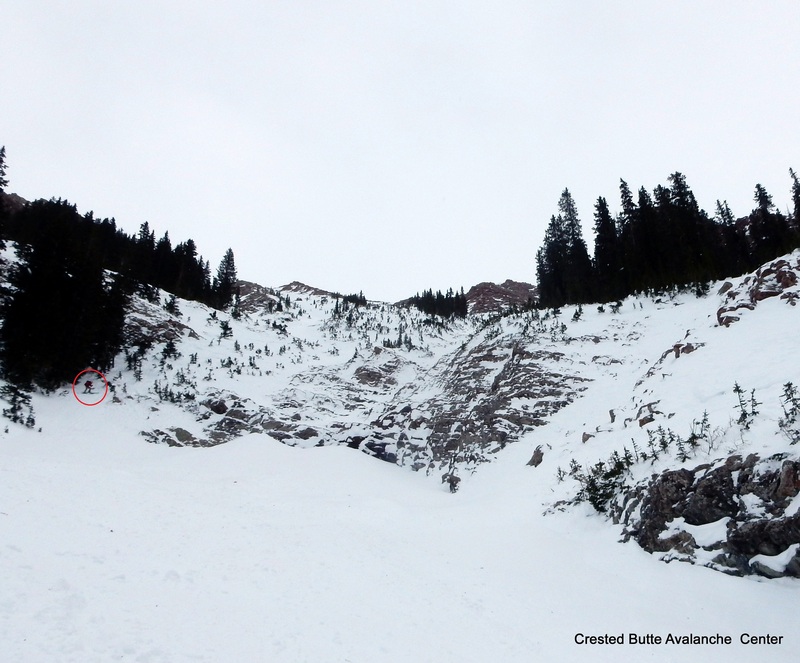 The injured skier and the skier’s partner evacuated down the rest of the slide path and down part of Copper Creek Trail before CB Search and Rescue arrived and assisted in the evacuation. We will publish a full report summarizing the weather, snowpack, accident, and rescue in the future. 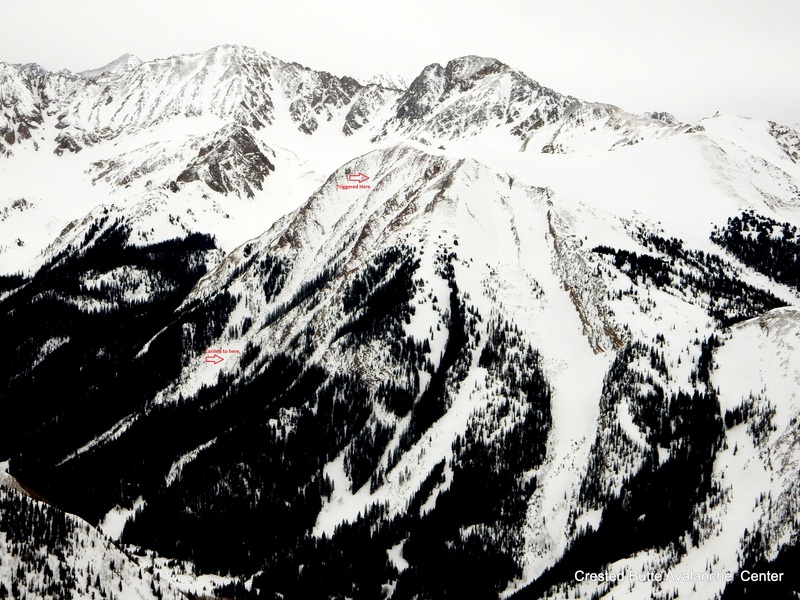 Snowpack: No red flags in our tour to and from the avalanche location. No cracking, no collapsing, no recent avalanche activity (except small wet loose on steep southerlies from yesterday), no active wind or snow loading (despite strong to extreme winds today). The parties skin track from yesterday was still largely in tact, suggesting there was minimal snow transport in this area yesterday. 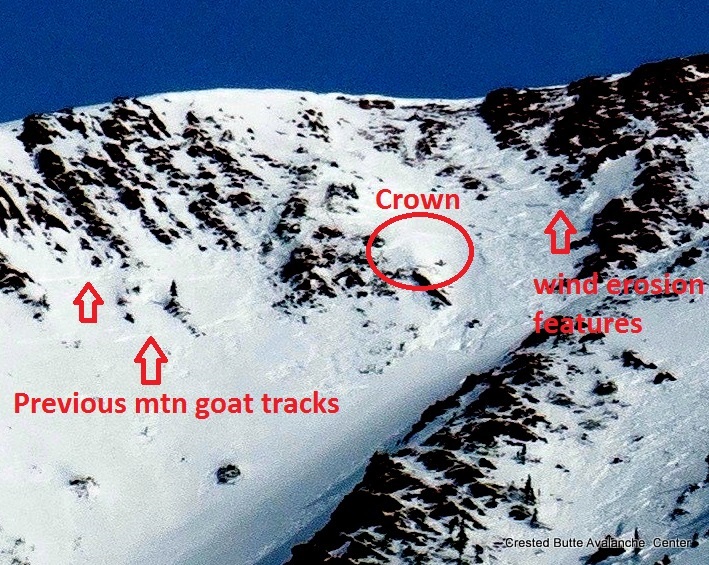 The slide was triggered on a west aspect above treeline at 12,200 feet, above Copper Creek. We traversed across portions of the same slope digging numerous hand pits. The snowpack is generally weak but lacking a slab because it is heavily wind-scoured. The structure consists of either a shallow (less than 50 cm) and fully faceted snowpack, or a faceted snowpack capped by a breakable melt-freeze crust. Behind a few isolated trees and in concavities on this slope, there were shallow hard slabs 3″-5″ thick over this structure. It appears that the slab that was triggered was an isolated drift over this weak structure, which likely failed on crust or facets. The crown was wind scoured or smoothed over by the time we visited the site, so we don’t have any direct crown observations from where the slide was triggered, except for a small pocket lower down on the slope that also pulled out. Location of the avalanche, on a sub-ridge of White Mountain above Copper Creek. Looking down the slide path from near the crown. The crown of a shallow hard slab over weak facets that pulled out lower down the path. The slide and skier were carried over a cliff band. Skier circled in red for scale. 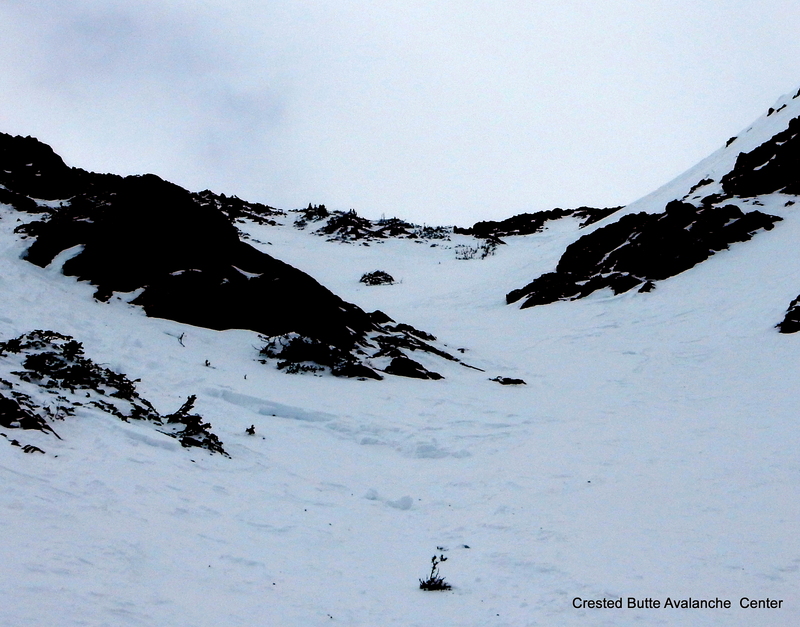 Skier was recovered on top of about 3 feet of debris, a relatively small avalanche.